Divya Giloy Kwath brings to you the goodness of giloy which has very effective and multifarious medicinal properties. Giloy cures fevers from viral infections (dengue, chikungunya, etc.) and helps you recover holistically. Giloy cures cold and weakness due to low platelet count. It detoxifies your system and gives you glowing skin. 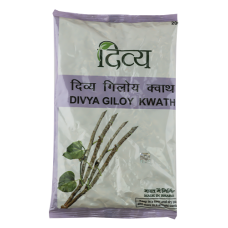 Giloy also boosts your immunity and keeps diseases at bay.